When it comes to TV channels American consumers say they absolutely must have, ABC, CBS, NBC and FOX (in that order) are still the four heavyweights as ‘must keep’ TV brands, according to the 8th edition of the annual syndicated brand tracking survey, Must Keep TV, from Solutions Research Group. The big brands among the cable channels – ESPN and Discovery – follow close behind at the #5 and #6 position overall, with HBO, home of the hugely popular Game of Thrones, coming in at #7, its best showing since in 8 years, followed by History and PBS. Rounding out the top 10, and moving up seven spots from last year is AMC (home of three big cable hits in Breaking Bad, The Walking Dead and Mad Men). AMC has risen in popularity across all age groups and also was the top brand over a 5-year period, up an impressive 36 spots from #46 in the 2011 research to #10 in 2015. Other big momentum brands over this longer period were CW, FX, HGTV and PBS. 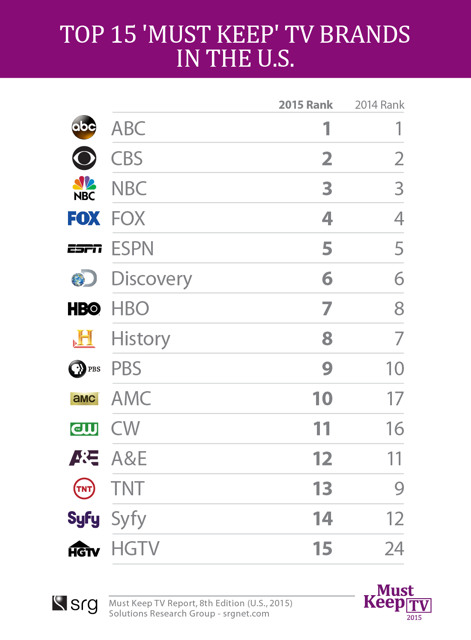 ABC, FOX and CBS are the top 3 brands for the 18-34 demo. ABC Family and AMC are new to the top 10 for this age group. ESPN continues to be the top cable net among Men 18-49 followed by HBO and Discovery. Top 5 ‘must keep’ brands for Women 25-54 stay the same as last year: ABC, CBS, NBC, FOX and Discovery, in that order. 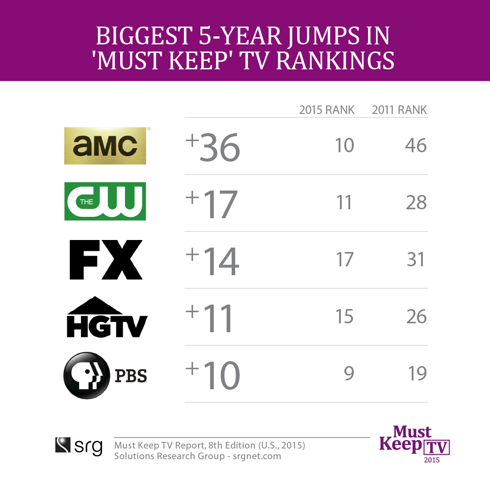 Entering into the Top 10 this year for the first time ever: HGTV and ABC Family. History and Lifetime were out of the Top 10 for a short while but are back this year. ABC wins the top brand honors among the African-American audience followed by CBS. Discovery, PBS, CW, AMC, Comedy Central, Showtime and CNN improved their rankings significantly over last year in this segment. Top 5 remains consistent with last year among the Latino Audience: ABC, CBS, FOX, NBC and HBO. ESPN is in the #6 spot and the rest of the Top 10 include PBS, Univision, ABC Family and AMC. Top 10 brands in $100K+ households are ABC, FOX, CBS, NBC, HBO and ESPN, followed by PBS, CNN, ABC Family and History. For the first time in 2015, the survey asked consumers what they would do if their TV service provider stopped carrying their must-keep favorites. Four-in-five (84%) said they would take some kind of action. For example, 22% would switch providers, 11% would sign an online petition, 8% would complain on social media, 3% would complain to the FCC and 40% would complain to their TV providers. The top ten channels in terms of fan loyalty as indicated by proportion who would drop their TV subscription in the event of non-carriage are as follows: Telemundo, Univision, NBC Sports Network, FOX News Channel, Bravo, History, ESPN, AMC, ESPN2 and FOX Sports 1. Technical: ‘Must Keep TV’ tracking is an independent syndicated brand tracking survey conducted by Solutions Research Group (SRG) among a representative sample of American consumers. This is the 8th edition of the survey since 2007. The questions have been fielded and presented in the same manner each year. The 2015 research is based on online interviews with 1,400 American consumers 12+ conducted in April 2015 – the sample captures and represents all major population segments.